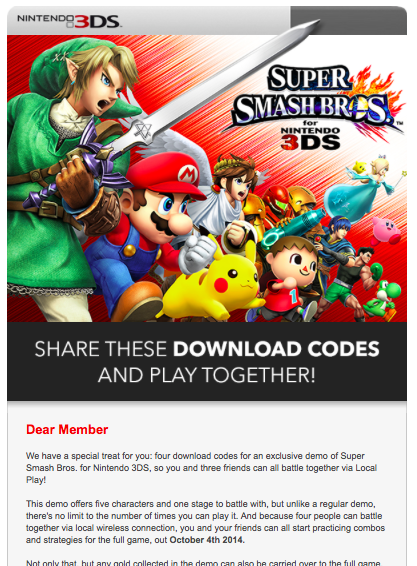 I was lucky enough to snag a code for the demo of Super Smash Bros. for 3DS. Needless to say, all unessential activities have been put temporarily on hold. If you weren’t fortunate enough to snag a code, here are some impressions to hold you over till the 19th. After its humble blocky N64 origins, Smash has become a graphical showcase for Nintendo. In this regard, Smash 3D (what I’ll be calling the game from now on) holds up well. Sora and Namco have done a great job of playing to the 3DS’s strengths and minimizing weaknesses. Smash 3D’s graphical style has been changed from Brawl. It has a softer cel shaded style that complements the game well. On a technical level, the visuals are a noticeable step down from Brawl. The textures are simpler and the backgrounds are less detailed. This is expected considering the horsepower of the 3DS. With all of that being said, Smash 3DS is a great looking title. While textures have been downgraded, animations seem more fluid. The color palette has been altered to focus more on bright primary colors that help characters pop on the screen’s limited real estate. Whether playing in 2D or 3D the game runs at a seemingly rock solid 60 FPS. Even with 4 players on stage, a Pokemon, an assist trophy, and several items bouncing around, the framerate held up admirably. All in all, this is one of the best looking titles on the 3DS. The most important elements for a fighting game are quality of the models, framerate, and fluid animation, and Smash 3D excels in all of these regards. As for the 3D effects, they’re what you’d expect. If you enjoy the 3D feature on the 3DS, you’ll enjoy it here. The game makes modest use of 3D elements, as you’d expect from a fighter, but there are some nice touches. For instance, when the cuckoo item becomes enraged, cuckoos will flutter off-screen towards you. The beam sword’s swing will extend ever so slightly beyond the boundaries of the screen. Unlike some other 3DS games, the 3D is clean without much ghosting. If you don’t like 3D in your games, Smash won’t change your opinion. After playing Smash for over a decade on a Gamecube controller, players will need to adjust to the 3DS control scheme. 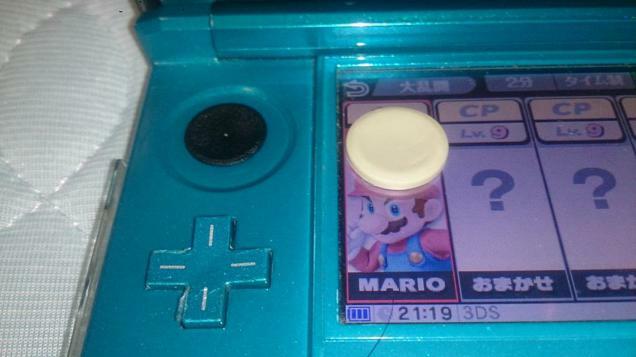 While the lack of a second stick will irk longtime smashers, the 3DS is more than serviceable as a Smash controller. The circle pad is surprisingly comfortable. Short hops and fast falls posed no challenge after a few “getting to know you” rounds. Any button you need will be readily accessible and responsive. The simplistic control scheme of the Smash series allows the game to translate to a portable with relatively few compromises. The demo version doesn’t have the option to customize controls so you’ll have to deal with the default scheme for now. Here, I’ll discuss the overall changes to the gameplay. As many have stated, Smash 3D feels like a compromise between Melee and Brawl, albeit one that leans distinctly more towards the latter. Characters have more weight to them than they did in Brawl, but won’t fall like they have stones in their pockets as in Melee. Helping to balance out the game’s floatiness is increased hitstun across the board. Brawl had such little hitstun that even some jab combos were not guaranteed. The combo potential is still incredibly limited (which is a good thing in my humble opinion), but it is far easier to keep the pressure on after a hit compared to brawl. Landing lag has been adjusted on a move by move basis, but generally seems to be reduced. In laymans term, this means that after landing during a jump attack, you can begin another action more quickly. On a similar note, dash attacks have generally been improved across the board. In Brawl, using a dash attack to do anything but punish a whiffed move was saying “please grab me”. This time around, dash attacks either end quicker, or go further. Most characters can space their dash attacks well enough that even if shielded, they can’t easily be punished. With more viable dash attacks and more viable aerial moves, characters have more options to approach a defensive opponent. Ledge mechanics have been changed, and I’m still trying to get a handle on them. If you’re holding onto the ledge, another character can grab it away from you. This means that the timing on edgeguarding is very strict. It was hard to test this element with a computer opponent, but it seems that there is a very small window after grabbing the ledge where an opponent can’t take it from you. To me, this was a disappointment, but it is necessary to prevent people from abusing ledge invincibility as they did in Brawl. The combination of these and other factors mean that Smash 3D is a fair bit faster than its predecessor. We’re not talking about Marvel vs Capcom or Melee speed here, but the game seems to strike a nice balance. It is neither too fast to be accessible nor slow enough to bore veterans. With that out of the way, we can talk about the important thing, the characters. The demo has five characters available, Mario, Villager, Link, Pikachu, and Mega Man. I’ll give each their own section. Mario hasn’t changed all that much from his days in Brawl where he was a mediocre character at best. However, Mario benefits from the overall changes in gameplay. Increased hitstun makes Mario’s juggling game stronger, and the decreased lag on a few of his aerials really helps him safely apply pressure. Mario’s gameplay (or at least my Mario’s gameplay) still revolves heavily around his back air, and up air attacks. Both of these have seen subtle improvements. Back air has less lag on landing while up air seems to be just a hair faster when coming out. As with most moves, both have increased hitstun enabling Mario to chase air opponents more aggressively than before. Mario’s biggest change is also one of the simplest. Mario’s down throw has nearly no knock back. This may sound like a disadvantage to newer players, but it is actually a great thing. Down throw can easily be followed up, most likely by a series of up tilts, leading to big damage at low percentages, especially to heavier fighters. Even at middle or high percentages, Mario’s throw can usually be followed up by his up air. I haven’t been able to chain multiple down throws, but even without a true chain grab this one change will help Mario immensely. 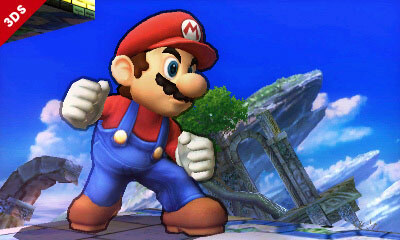 Mario now has an effective way to deal a big chunk of damage each stock, and is a more threatening character up close. In terms of special moves, nothing major has changed. Fludd is still nearly useless as far as I could tell. Fireballs are the same as you’d expect. Mario’s cape is slightly faster which is nice. Jump punch has higher knock back, but it’s still not all that powerful, and its risk outweighs its benefits of using it offensively. As a recovery move, it works the same as ever. Mario’s smashes and tilts are also about the same. The only change is his down tilt which has less lag and more hitstun. This makes the move change from completely worthless to mostly worthless. The move isn’t as terrible of an option as it was, but there are few situations where it is Mario’s best option. As a player who likes Mario, I’m cautiously optimistic. Mario’s slight changes combined with the overall changes to the game’s engine have the potential to make him a solid character. There is nothing to indicate Mario will be truly exceptional, but it seems like he could at least make it to average, which is a lot better than he was in Brawl. Link was one of the worst characters in Brawl. You might expect that he would see some major improvements this time around, but that is not the case. Link has certainly seen some improvements, but I’m not sure if all of those little changes will add up to big things. Links projectile game is largely unchanged. His bow may be slightly more powerful, but it’s hard to say. One change that is very noticeable is the utility of Link’s shield. Like in Brawl, Link’s shield can nullify projectiles, but this time around it does so more reliably. The effect activates quicker once Link is done with a move. This may give Link an edge against rival projectile users. Link’s multi-hit forward and up smashes are both easier to hit fully. His down smash remains unchanged. In the air, link is similar to his Brawl counterpart. His up air has an awkward looking animation, but this does extent the sword further leaving Link less exposed. His down air is less powerful but doesn’t leave you as vulnerable as it whiffs. Link’s forward, back, and neutral air attacks have not changed in any immediately noticeable way. As I mentioned earlier, dash attacks have been improved. In Link’s case, this means a new attack based on his jump attack animation from Ocarina of Time and subsequent games. This attack packs a wallop and can KO opponents around 110%. The lunging element of the move makes it easier to punish whiffed attacks. The move is not 100% safe, but it is much safer than the move it replaced. Aside from these differences, Link’s spin attack comes out quicker. More importantly, with the changes to edgeguarding, Link’s spin attack is a much better recovery option. He can also grab the ledge with his chain even if someone is holding it. The new ledge mechanics help mitigate one of Link’s biggest flaws, and a few moves have seen minor or major improvements. Link is still pretty sluggish though, and his projectile game doesn’t seem effective against more agile foes. Link does feel better, and very fun to use, but I don’t see him being that much better than he was in the first game. Of course, I’m hardly an expert Link player, and there may be more subtle changes (particularly to his projectiles) that I’m not seeing. I never played Pikachu much in Brawl, and I didn’t like him too much here. On the plus side, his various multihit moves (back air, forward air, down Smash) are harder to wiggle (smash DI) out of. His aerials have less lag if you land in the middle of one, particularly his forward air. Pika’s dash attack lunges further making it easier to space the move appropriately and hits way harder than it did in Brawl. Pikachu’s dash attack won’t KO until high percentages (150+%) but it’s a good option when an enemy just won’t die. On the negative side, thunder is a lot weaker. It is quicker, but the thunderbolt doesn’t linger on the stage as long or do as much damage. It’s upwards range is no longer infinite, but it does spawn a cloud that could spike enemies in a glorious fashion. Pikachu’s down throw has higher knock back (the opposite of Mario) which seemingly takes away Pikachu’s chain grab. This leaves Pikachu without one of his most valuable tools. It is unclear whether his forward through can still chain grab, but it could not against any characters in the demo. Aside from those changes, I didn’t notice much of not about Pikachu. He feels a little more awkward to play as, but this is just one man’s opinion. His quick attack could still do damage, although it has a bit more knock back, so maybe experienced Pika players will get more mileage out of him than I did. It makes sense that Pikachu is a little less powerful here as he was one of the better characters in Brawl. Hopefully, other top characters were also weakened to balance things out. I didn’t expect to enjoy playing Villager as much as I did. He/she is a very weird character, but not in a bad way. 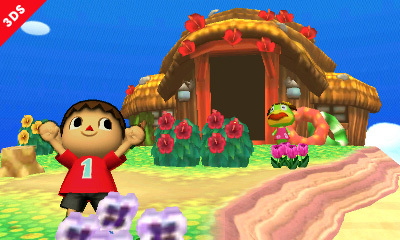 I can’t decide yet if Villager will actually be good, but I’m sure he will be fun to play as. Villager looks like a spacing character with interesting spacing options. Lloid rocked will be a big part of her game. These projectiles are slow and take time to set up, but they take up a lot of space, and limit your opponent’s options. The rocket does decent damage, and you can ride it which boosts its power. Villager’s down B will plant a sapling the first time it is used. Once the sapling is planted, you can use down B to use your watering can. This is primarily for watering the tree, but it also functions as a much weaker version of Mario’s FLUDD. Once the tree is planted (which hurts the enemy when it spawns), your down B becomes an axe. The axe can chop the tree down, which will do major damage to anyone standing beneath it. Villager’s down B is notable for two reasons. Firstly, the tree becomes an effective shield that will stop projectiles. For the time the tree is active (10 seconds or so) Villager has a safe place to camp. This move also gives Villager access to the axe which can be used on opponents. The axe is fairly quick and powerful, but has a lot of lag. Sometimes, when the tree is chopped down, it spawns a piece of wood that can be thrown like Zero Suit Samus’ armor from Brawl. Villager can use his slingshot with forward and back air. The pellets do more damage up close than afar. They have low damage and knock back. These moves may be useful against characters like Marth who rely heavily on aerials for spacing, but are hard to use against grounded opponents. In particular, Pikachu was very difficult to target on the ground due to his size. Up and down air attack with one, two, or three turnips. The three turnip variety of the move sports good power, but the random nature of the move makes it an iffy KO move. When playing as Villager I struggled with KOs. His bowling ball forward Smash was the strongest smash in the demo by far, but is sluggish. It can be dropped off of edges which is fun if not always practical. Villager’s fireworks up smash is nifty, but not very powerful. His down smash buries opponents like a pitfall, but I was able to button mash my way to freedom quickly even at high damage. Aside from his forward Smash, Villager’s best KO move was hit up tilt which pokes opponents with a stick. More often, I relied on chasing foes offstage and slingshoting them off the edge. My favorite attack for Villager is his dash attack which chucks a pot forward. On the ground, the pot doesn’t go very far, but it will go further if thrown off of an edge. This may not be practical in battle, but it is fun. His grab uses a net which is also fun, but slower than other grabs. Villager’s recovery is a mixed bag. His balloon trip Up B has incredible range, but he cannot attack out of it. Any attempt to attack will put him in helpless state. Villager users will have to be crafty if they want to make it back to the stage unmolested. Lloyd rocket is another option that is well suited for horizontal recovery, but also leaves Villager vulnerable. Villager’s pocket move stores enemy projectiles for later use. Villager can pocket pretty much any projectile and then some. He could pocket Mega Man’s air shooter, he can pocket items like barrels and stop watches, and so on. In item matches, this move is especially interesting, allowing Villager to store items for more opportune times. Due to his uniqueness it may be some time before Villager is figured out. I didn’t have much success with him, but I had a hell of a lot of fun. Mega Man is easily my favorite character so far. Like Villager, the Blue Bomber has a playstyle that differs vastly from what we’ve seen in Smash history. He may not wind up as one of the best, but I feel like Mega Man will be very annoying to fight against. Mega Man’s most notable feature is his Mega Buster. The Mega Buster serves as Mega Man’s jab, neutral air, and forward tilt attacks. Mega Man can fire three shots in a row, which don’t deal much damage. The bullets have a tiny bit of hitstun, a little bit less than Falco’s lasers, and travel about 1/4 of the way across final destinations. Firing the Mega Buster was able to negate most incoming projectiles. Mario’s fireballs and Link’s boomerang could be taken out by one shot each. Sturdier projectiles like Villager’s Lloyd rockets went down after 3 shots. Mega Man’s pea shooter is quite the hinderance that can constantly and infuriatingly interrupt your opponent. The shots will stop moves in their tracks and stop momentum in the air. This allows Mega Man to apply pressure consistently. His Mega Buster is supplemented by a more standard projectile, the Metal Blades. Metal Blades are nothing to write home about. They’re a fairly basic projectile that deal low damage (6-7%) and knock back. They can be fired at different angles, and if they hit the ground, they can be picked up as an item. They can also be grabbed out of the air. Mega Man can only have one on stage at a time. The Crash Bomber is a unique attack that functions as a less powerful sticky bomb. The bomb isn’t all that powerful, but it serves as a distraction that allows Mega Man to keep up his projectile pressure while disrupting enemy offense. The Leaf shield is another projectile option, but I don’t see its usefulness. It doesn’t protect Mega Man all that well, it does a pitiful amount of damage, and it prevents him from using his A moves. It kills all of his aerial momentum like Game and Watch’s bucket, so it may be useful for that aspect, but as an attack I found it useless. To complement his projectile game, Mega Man has a decent set of aerials. His flame sword is like a slower version of Marth’s forward air. It’s not amazing, but it’s serviceable. His back air is better. The Slash Claw is a two hit combo with solid knockback that comes out quickly. It’s great for attacking foes who are offstage and is an all around strong KO move. Mega Man’s up air is air shooter. He fires a tornado upwards. Its range allows Mega Man to attack without getting too close, and it can carry opponents off stage at high percentages. Mega Man’s down B is the Hard Knuckle. The Hard Knuckle has good range, and it can spike. The range of the attack makes it a safe way to try to spike your opponent, and also a safe poke on stage. When used, the move has an odd hover effect for a moment which may prove useful. Interestingly, the hard knuckle can be reflected by Mario’s cape. Using forward Smash will charge your Mega Buster. The charged attack can travel about halfway across final destination at full charge. It is a bit slower than average for a smash, but its range gives it some useful applications. It can be used for shield pressure, punishing, and tech chasing in a way that other forward smashes can. Conversely, it’s not as useful up close as other smashes may be, and it isn’t very powerful until it’s charged. This move can be reflected and pocketed by Villager. Mega Man’s down smash and up smash are standard issue. His up smash attacks above him. It’s similar to Zelda’s up smash, but with narrower range and lower knock back. His down smash shoots out fire on both sides, similarly to Squirtle’s up Smash from Brawl. Down Smash is powerful, but only if you hit it as it starts. Mega Man can slide using his down tilt. The slide is an interesting mobility option, and one of his quicker attacks. If spaced correctly it is somewhat safe. His dash attack is a good one. Top spin covers a good distance making it good for punishing, and it can whittle away shields. It’s not completely safe, but it doesn’t leave Mega Man too vulnerable. The Mega Upper is one of Mega Man’s best KO moves. It functions a bit like Luigi’s up B. If you hit the opponent right up close, it is very powerful, and can knock out lighter opponents at around 80%. If you don’t hit it dead on, it does significantly less knock back. While the move comes out quickly (relatively quickly considering its power), it is easily punishable on block. That’s Mega Man in a nutshell. Mega Man has a lot of attacks that don’t do much damage, but hinder your opponent from doing what they’d like. He can likely shut down characters who like to approach with short hopped air attacks, and his various projectiles spell trouble for bulky characters like Donkey Kong or Bowser. Mega Man has an incredibly unique moveset, and it’s difficult to see how it will all come together. 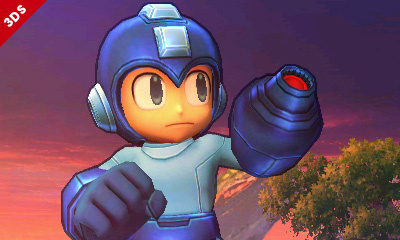 I feel that once better Smash players get a hold of Mega Man, he’s going to pose problems to many fighters. However, agile characters like Wario, or characters with reflecting moves may be hard to overcome. All signs indicate that Smash 3D will be an excellent sequel. The two new characters on display are each incredibly unique. If the other newcomers (aside from clones) are as well-developed, then the diversity of playstyles on display will be incredible. The game makes the most of the 3DS hardware and is very attractive, even if it does have to make some sacrifices compared to its console cousins. Most importantly, the changes made to the core mechanics are for the better. It will take some time to render a final verdict, but the game is faster, more fluid, and strikes a better balance between offense and defense than its predecessor. The bottom line is that even with five characters, one stage, and no multiplayer, I’ve managed to squeeze hours of enjoyment out of this demo, and I can’t wait to be done writing about it so I could play some more. There is a good reason the hype for this game is through the roof, and all signs point to Smash Bros for 3DS delivering.